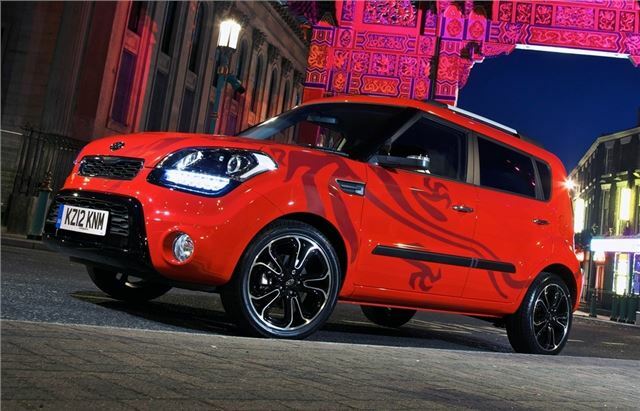 Not to be outdone by the new Skoda Yeti Urban, Kia is getting in on the act with its Soul Inferno, the latest in a long line of special edition Soul models. The new special edition sits alongside the Hunter and Quantum versions at the top of the recently facelifted Soul range and costs £18,695. The Soul Inferno gets Tornado Red paintwork complete with 'tattoo-style' dragon graphics, a rear spoiler, silver roof rails and 18-inch Black Petal alloy wheels. The rear windows get privacy glass and there are LED daytime running lights plus black high gloss mirrors and bumper inserts. The red and black theme continues inside with black leather upholstery and a contrasting red leather gear lever plus red mood lighting in the doors. Standard equipment includes air conditioning, cruise control, heated front seats, electrically folding and heated mirrors and electric windows. There is also iPod connectivity, Bluetooth, a smart key with start/stop button and rear parking sensors. It comes with the 1.6 CRDi 126PS engine and a six-speed manual gearbox, averaging a claimed 57.6mpg with emissions of 129g/km meaning a VED band of D - currently £100 a year. Insurance is group 19 while the Soul comes with Kia's seven-year warranty which can be transferred to subsequent owners.